One of my all-time favorite childhood treats is lemon bars. When made well, they are sweet and citrusy. They taste like sunshine. 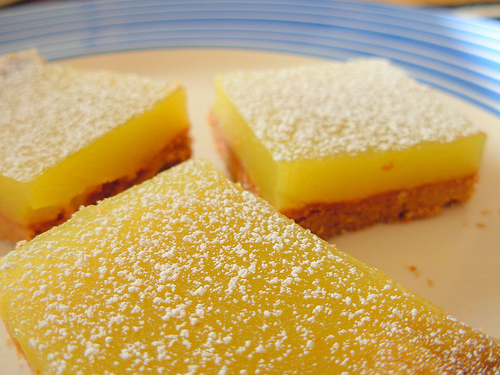 There are two secrets to excellent lemon bars – a crumbly short crust and a smooth lemony curd that’s not too sweet. Often, I tweak recipes to make them my own, but in this case I actually found lemon bar perfection from Cooks’ Illustrated’s Baking Illustrated. When I can find them, I use Meyer lemons for the curd. Otherwise, I pretty much follow the recipe exactly as is because it is nearly perfect. One hint – don’t sprinkle powdered sugar until just before serving, or it will likely melt into the bars. I think this lemon curd (doubled recipe) would be perfect in lemon meringue pie, as well.